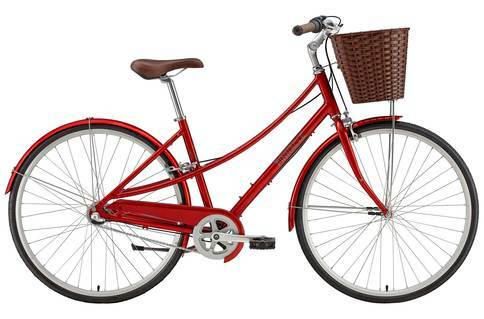 Are you looking for a women’s bicycle that is a throwback to a bygone era but still maintains all of the modern fixings? If so, then the Pinnacle Californium will the ideal choice for you. This bike weighs 13.5 kilograms and the frame is made from aluminum. It comes equipped with three gears. This bike has a very reasonable price tag. With the Pinnacle Californium it really was love at first sight. The bicycle was straight of an old movie, complete with a brown basket. While looks are important, that is not all that you need from your bike. So, we saddled up and took the Californium for a spin. We were pleasantly surprised by this bike. While it may look whimsical, it certainly does not function like it. In fact, it was a pleasure to ride this bike. Not only was the ride incredibly smooth, the Californium handled beautifully. The gears, in particular, were easy to switch around. This is definitely a bike that can be used for daily commute. This is largely due to how comfortable it is. You are not going to feel sore after riding around on it for hours on end. The fact that this bike is so maneuverable makes it even more fun to ride about. That being said, this is definitely not the lightest bike on the market. At a little over 13 kilos, it is easy to feel the weight if you plan on climbing with it. Therefore, it is a lot better to stick with flat terrain. Another reason why the bike is not the greatest for climbing is due to its limited gears. While you will not have much trouble getting up and down some gentle slopes, anything more may prove to be too challenging. Nevertheless, there are plenty of features to make up for it including the basket and the option to add more storage add-ons. This makes the bike a lot more versatile and functional, particularly if you plan on riding it to work and back. From its appearance to its cycling performance, this bike really is an affordable dream. If you are looking for something to get you around while maintaining a sense of sophistication, then the Pinnacle Californium Californium is for you. You will not even have to pay too much for the privilege.